Join the discussion on our forums! 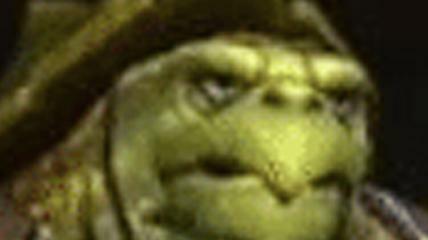 Come discuss Ornery Tortoise over in our dedicated Ornery Tortoise discussion topic. Build a beast this with Swamp Leech and you’ve got no downside! scary with houndmaster but not that great overall. Healadin might want this for consistency. What did they do to you, my wayward grub? A turtle has made it to the water! And it grew to become a 3-Cost 3/5 Battlecry: Deal 5 damage to your hero. This curving into Houndmaster could be terrifying. sooooooooooooooooooooooo Pit Lord never saw play, so i think this won't, but that was a card for aggressive decks, since this is for a control deck i would imagine, and comes in earlier, could this make it's way into the heal paladin? 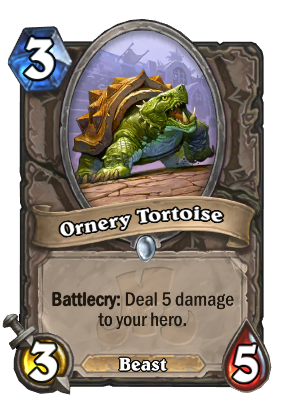 Not that it's going to be a thing, but Ornery Tortoise could be run in Odd Priest to help create opportunities to leverage the buffed hero power. The minor tempo boost over a typical 3 drop isn't that much, though. So maybe that turtle will made it to the water? He's upset that they won't let him be a Tortollan.